Buy your Visioneer Scanners from ScanStore and our dedicated scanner experts will be there to help if you need us. Online feature comparisons, user reviews & live support chat. Strobe XP 450 20ppm Color Simplex 8.5x14"
XP 450 PDF is the ideal solution for business users who need a fast document scanner with a small footprint. The Strobe XP 450 PDF with its 6" x 13-1/4" footprint fits neatly on a desk, holds up to 50 documents and scans 20 pages per minute. * The Strobe XP 450 USB includes Visioneer's award-winning OneTouch technology, which is tightly integrated with ScanSoft PaperPort Deluxe 9 making it easy to scan directly to PDF files. No computer required to scan! Experience the Freedom of True Mobility. Scan without a Computer, Cables or Software! Strobe XP 200 6ppm Color Simplex 8.5x14"
Strobe XP 200 is the ideal solution for business users who need a fast scanner with a small footprint. The Strobe XP 200 fits perfectly between a keyboard and monitor and scans approximately 6 pages per minute. Strobe XP 200 is tightly integrated with ScanSoft PaperPort Deluxe 9 making it easy to scan directly to PDF format. Now you can scan and file all of your documents and photographs electronically right alongside your electronic documents from Microsoft Office, PDF files from Adobe Acrobat and image files from numerous other applications.. The Visioneer 9450 USB has everything you need for a solid ADF scanning solution. It can hold up to 50 sheets of 20 lb paper and scans up to 8 pages per minute. The Visioneer 9450 USB comes complete with ScanSoft PaperPort Deluxe™ 10, TextBridge® OCR 9.0 Pro and ArcSoft PhotoImpression™ 3.0 by Visioneer. Patriot 430 18ppm Color Duplex 8.5x14"
9650 USB 12ppm B&W Simplex 8.5x 14"
The 42-bit color Visioneer 9650 USB scanner offers three key capabilities essential to effective office productivity scanning: high speed 12 page per minute throughput, a reliable automatic document feeder and a low purchase price. 9750 PDF 20ppm Simplex 8.5x14"
Patriot 470 33ppm Color Duplex 8.5x11"
The Patriot 470* is the faster, easier, better workgroup scanner solution. The price and performance leader in its category, it includes a powerful suite of applications that improve image quality, OCR accuracy, and document management. Its revolutionary OneTouch scanning and small compact size make it easy to use on your desktop or in any department. The Patriot 470 features 600 dpi optical resolution, 48-bit internal color and a Hi-Speed USB 2.0 interface. The TAA and GSA compliant Patriot 680 color duplex departmental flatbed scanner with 100-page capacity ADF scans documents at 40 ppm and 80 ipm through hi-speed USB 2.0. The pre-set Visioneer OneTouch™ software feature can be configured to scan to 99 destinations eliminating multiple steps to scan-to-email, to-print, or custom destination. Software bundle includes Kofax VRS Basic, and ScanSoft OmniPage. The use of departmental scanners for regulatory compliance is sharply on the rise from Sarbanes-Oxley to the Patriot Act to SEC 17(a). The Patriot 680 solution easily converts scanned documents into text-searchable PDF files at the press of a single button. Strobe XP 100 5ppm Color Simplex 8.5x14"
The Strobe XP 100 is the perfect companion for the mobile executive. 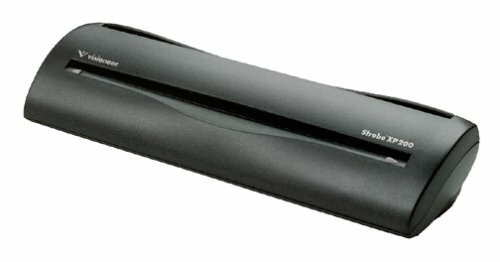 Use it to scan and organize all of your documents, photos, articles, brochures, and business cards. Packs easily in a laptop bag. Powered by the USB port to scan anywhere. Road Warrior 6ppm Color Simplex 8.5x14"
Strobe 400 12ppm Color Duplex 8.5x37"
Powered through a USB port, or wall power adaptor. 6 seconds per image in duplex mode speed. Automatic Crop, Deskew and Thresholding image-enhancing features. Scan to 6 Front Panel Selectable Destinations. Scans documents, plastic ID cards, checks, business cards. Strobe XP 220 6ppm Color Simplex 8.5x14"
The Visioneer Strobe XP 220 Sheetfed Color scanner is a perfect tool for mobile professionals. The Strobe 220 utilizes Visioneer's exclusive OneTouch with Kofax VRS technology for the finest image quality. At 600 dpi and 10 pages per minute speed, no professional should be without one. Strobe XP 300 10ppm Color Duplex 8.5x14"
More info on Visioneer Scanners. How can I get non-consumable replaceable parts for my Canon, Visioneer, or Xerox scanner? This page was designed to help you find Visioneer Scanners quickly and easily. Click Here to find Visioneer Scanners. Click Here to find Visioneer Scanners.